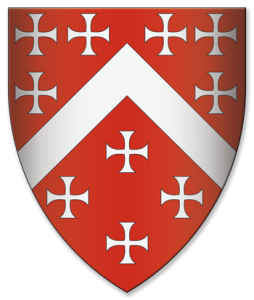 Thomas de Berkeley was born in 1245 at Berkeley, Gloucestershire, younger son and heir of Sir Maurice de Berkeley (d. 1281) and Isabel Fitzroy, the daughter of an illegitimate son of King John. In 1267 he married Joan de Ferrers, daughter of William de Ferrers, 5th Earl of Derby and Margaret de Quincy. He fought in numerous battles, such as Evesham (1265), Falkirk (1298), Caerlaverock (1300), and Bannockburn (1314) – and is said to have spent nearly every year for the last 50 years of his life employed against the Welsh, the Scots or the French. Known as “Thomas the Wise” he was a Commissioner investigating the claims to the crown of Scotland in 1292, served as an ambassador to France in 1296, and again eleven years later to visit Pope Clement V, and he held the post of vice-constable of England in 1297. He was elevated to the peerage as Baron Berkeley in 1295 with his summons to Parliament. The title later became abeyant in 1422. Sir Thomas fought at Bannockburn on 24 June 1314, at which time he was in his sixty-ninth year, together with at least one son and two grandsons. Following the English loss, he was taken prisoner, and eventually released after a large ransom was paid. He died on 23 July 1321 at Berkeley, Gloucestershire and was survived by his son and heir Maurice. His wife predeceased him, and was buried in St Augustine’s Priory, Bristol.